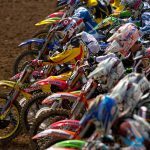 Ryan Dungey, Ryan Villopoto and Blake Baggett will represent the U.S. in the 2011 Motocross of Nations, Sept. 17-18 at Saint Jean D’Angely, France. Monster Energy Kawasaki‘s Villopoto currently leads the 2011 AMA Motocross 450 class points standings while Rockstar Makita Suzuki‘s Dungey (pictured above) sits seven points back in second place. Monster Energy Pro Circuit Kawasaki racer Baggett is second in the 250 standings as the highest placing American racer. Motorcycle Hall of Famer Roger DeCoster will again manage the U.S. team which will try to win its record 22nd MXoN title this year. 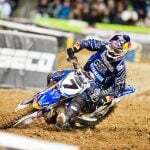 Team U.S.A. won the 2010 MXoN in Lakewood, Colo. The team has not announced which class each of its riders will compete in. Baggett will likely race in the mostly 250cc MX2 class while Villopoto and Dungey will split the mostly 450cc MX1 class and the Open class. 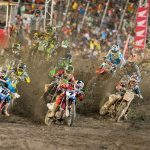 The American Motorcyclist Association (AMA) is pleased to announce the members of the U.S. team that will compete at the FIM Motocross of Nations, Sept. 17-18, at Saint Jean D’Angely, France. 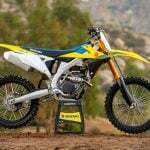 The 2011 team will include Rockstar Makita Suzuki’s Ryan Dungey, Monster Energy Kawasaki’s Ryan Villopoto and Monster Energy Pro Circuit Kawasaki’s Blake Baggett. Perennial U.S. Team Manager and Motorcycle Hall of Famer Roger DeCoster will manage the team in its hunt for a record 22nd Motocross of Nations Championship. 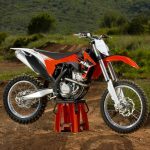 Riders in the Motocross of Nations compete in either MX1, featuring mostly 450cc four-stroke machinery; MX2, featuring mostly 250cc four-stroke bikes; or the Open class. The U.S. team will announce each rider’s designated class closer to the event. The Motocross of Nations is one of the most high-profile motorsport events in the world. It features national teams competing for a combined score to determine the overall championship-winning country. The event emerged in post-war Europe in 1947 and has run uninterrupted since that time. The United States is the all-time leader in Motocross of Nations overall victories with 21. Great Britain is second with 16. The United States is the reigning champion of the Motocross of Nations, winning in 2010 when the event was held in Lakewood, Colo.